The Latest with David Jay: Funny Story! So my buddy Deyl was over last night and he said the craziest thing happend the other day... He searched for my name on iTunes (I dunno why he was stalking me) anyway... some people popped up and he started watching this podcast and he first said the photos were awesome and he loved the song and just had to know who it was. So he writes to this photographer and the photographer writes back saying, "Hey Deyl...are you still doing some video stuff?" Wild huh! It totally tripped him out so he showed me who it was and it was JT Pals! Haha! Isn't that so awesome! For those of you who didn't know JT used to be in video and still incorporates that into his stellar photo business so he must've remembered that I started a video business with Deyl way back in the day! Carla Bruni is HOT!!! I totally love her voice and guitar! That's so funny that Deyl ran across my podcast!! Sweet stuff!! Hey David. I am a student at Brooks Institute of Photography and I am hoping to be a wedding photographer when I graduate. I got hired to shoot to shoot my first wedding this summer and I am planning on updating my digital system. I was looking at the Canon 5D and the 1D MarkII and I am not sure which to really consider would be a good investment for the future. Could you give me some advice on what you think? Side note...I love your site by the way! Absolutly amazing! Thanks. Hey Heather! :) Thanks so much! My buddy built it for me and he's absolutely incredible! 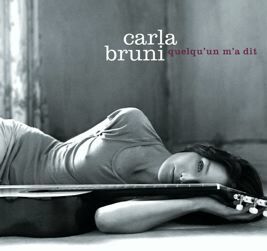 Bruni is like a french norah jones! Hi again. Thanks for the invite to try shooting with the MarkII I will be taking you up on that offer for sure. David I forgot to ask you when is the next time you are coming to Brooks? I saw on your site May 6-7 is that true? Talk to you later. Dude! This is the music I was playing in the OSPMC mansion and talking about at Disneyland! I ran across her music about a month ago...anyway, Colon has this french song by Serge Gainsbourg that, when translated, would not be allowed on air...and in fact wasn't allowed on air in France when it came out ages ago. This stuff would make a perfect replacement, although I've looked up her translated lyrics too and they're kind of a downer. Dj...I love Bruni's music!! I actually downloaded her CD after hearing Kevin/Fletcher talk about it while we were in line for the Materhorn at Disneyland. DJ- Is including Deyl's name one of your cleaver marketing strategies to get people like us to write a comment? Well, it's working and I am a bit disappointed that I am so easily manipulated. Truth be told, I actually came to post that DJ is the blog king. Something that goes unsaid. I mean seriously...DJ gets 10 postings about a stinking song and I have to interview freaking Clinton & Lance and I only get 2 responses? What's up with that? I guess not everyone can be so cool. But that won't stop me from trying. dj, i posted her album on my blog last july. it's just about my favorite album to play while having people over to chill. i never saw the video, that was way cool! WHAT! No way dude! I gotta check that out! You're unreal man! Get some sleep though! Aren't you shooting in Palm Springs this weekend! I stalk you! All these cool people already know of her! I heard one of her songs for the first time while I was on my Cali trip and was sitting in a coffee shop. I asked the barista who was playing and then went and got the whole album!